« Do you have a letter for me? I’ve mentioned the precipitation of Ishikawa quite a few times on my photo posts. Even though it makes biking unpleasant and battling household mold a challenge in older homes, the constant rain in Ishikawa does make for a lush landscape. This photo was taken in May 2012 at Natadera Temple in Komatsu. Established by the priest Taichô in 717 BCE, Natadera is a sprawling temple complex with gorgeous gardens. 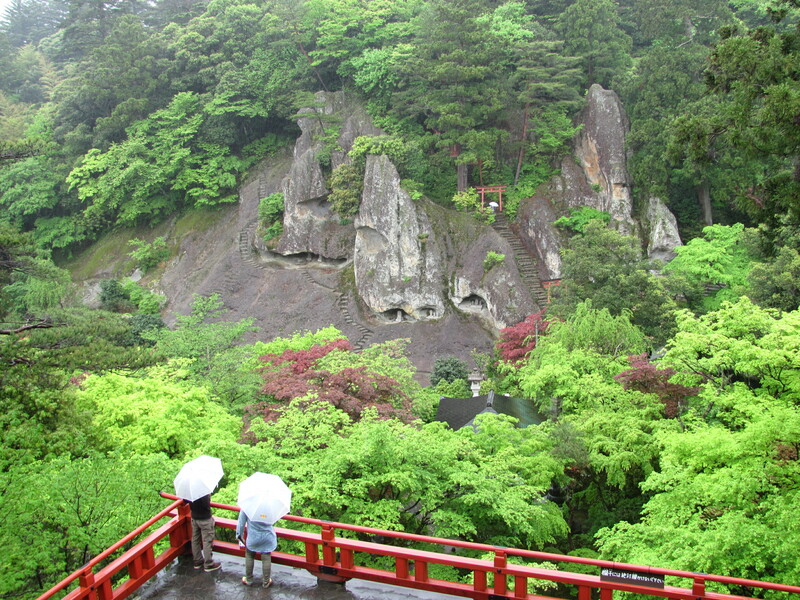 One of the highlights is the pavilion, which offers a view of the cliff-face, into which are carved shrines and paths. Natadera is one of the region’s famous temples, and yet, it’s so quiet there, even with other tourists roaming the grounds. If the great golden statue of Kannon were meant to inspire awe in worshipers, the paths through the temple complex must be meant for reflection. (One could say the same of cathedrals vs. Western-style labyrinths, I suppose.) It’s easy to see how Shinto and Buddhist beliefs overlap here, and, if you’re willing to spend a little time looking, you can find the shrine on the site, too.